Volunteering: what a good way to escape the monotony of daily life while at the same time doing something worthwhile! I was thinking a few months ago when preparing to launch into the adventure of working as an international volunteer. But the more I delved into the somewhat obscure and contradictory world of volunteering, foreign aid and development work, the more I realized that the issue is much more complicated than that. 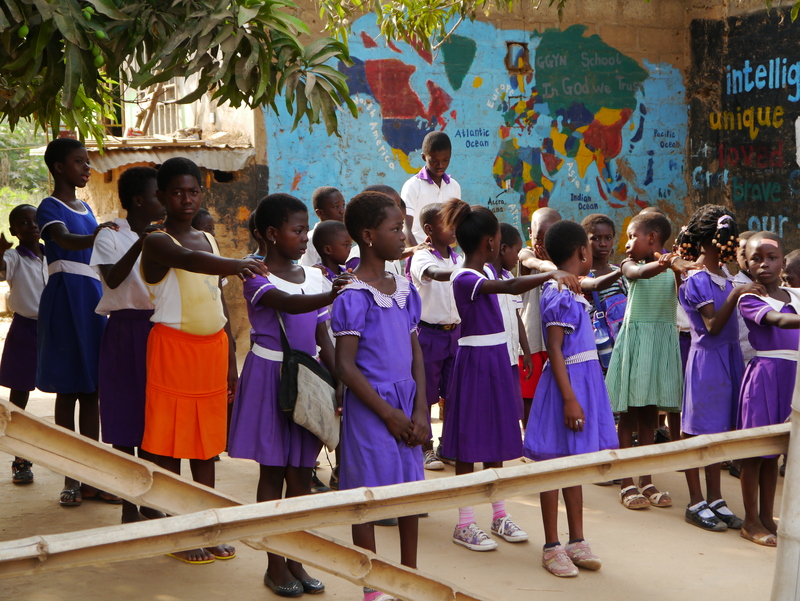 The day at our school always starts with the morning assembly: The kids come together before class and sing the national anthem. These were my thoughts before I started volunteering with a local NGO in Accra providing free education for kids whose parents can’t pay the school fee. The school was nothing more than a few tables and chairs under a large, shady mango tree. This image has become a metaphor for me even before going there and actually seeing the school myself – a metaphor for what is possible with nothing more than courage and inspiration, and a metaphor for the hardships the people are facing as teaching outdoors means being exposed to harsh weather conditions, sudden torrential rain falls and mangoes falling down and hitting the kids. The only mistake is in thinking that you will make an important difference in the lives of the people you’re among. The profound difference will be in you. What I realized in the end was that what makes international volunteering powerful is not the practical support I hopefully was able to provide on the spot, it is the potential to inspire and connect people across the globe who want to make a change. All your ideas, thoughts, suggestions and criticisms are very welcome, feel free to contact me or leave your comments! I have participated in a school-building project in rural Ghana (Piase, close to Kumasi) in 2009, and I can verify Theroux’ words. At the same time I want to say they are maybe true for short stays. If you are planning on being there for couple of months, do not underestimate the impact you make by humbly serving the country. It might not change the world, but it may change some kids’, and even adults’ world 🙂 (ok, corny mode “off” again) keep us posted! Maybe you should contact our cousin Reinhild Kim who is sponsoring a school project in Mali (to which I’m contributing, too). Good luck – an strength !